One of the first decisions you have to make when joining a cash poker game is how much money to put into play. Most casinos give you a range, with a minimum and a maximum, though some games are “uncapped,” with no maximum buy-in. What should you do? To simplify matters, let’s first specify that we’re talking about no-limit or pot-limit structures, which are often lumped together as “big bet” games. In fixed-limit games, your stack size has much less influence on the strategy of your play. Let’s further simplify the decision down to buying in “big” versus “small,” rather than talking specific dollar amounts. By “big” I mean at or near the maximum, or, in uncapped games, enough to have more chips in play than most of the other players. “Small” will mean at or near the minimum, or an amount that is less than most other players have in front of them. Alternatively, you could think of “small” (or “short”) as 50 big blinds or less, and “big” (or “deep”) as 100 big blinds or more. Given those definitions, should you buy in big or small? As with everything in poker, it all depends. It depends, first, on your bankroll. You should never put a single dollar on the table that you can’t afford to lose. You should also not put at risk more than a small fraction of your bankroll. Respected authorities disagree on exactly what fraction that would be, but I think it’s safe to say that nobody would recommend having more than 10% of your bankroll on the table at any point. Another factor is how much time you have to play. Suppose you’re just playing for an hour or less until you’ll be going to dinner or a show. Then you’re probably looking to “hit and run” — that is, hoping to double up with one big hand, and then walk away. A short stack is more conducive to that strategy. Conversely, a big stack is better suited to profiting via a long series of small pots, or by patiently waiting for one of those rare chances to get all of your money into a very large pot when you are a heavy favorite to win it. When bankroll and time are not limiting factors, the most important consideration is your skill compared to that of the other players. The bigger your skill advantage, the more you can utilize a deep stack. On the other hand, if you’re at a table of sharks, it’s probably smarter to buy in short, if you’re going to play at all. 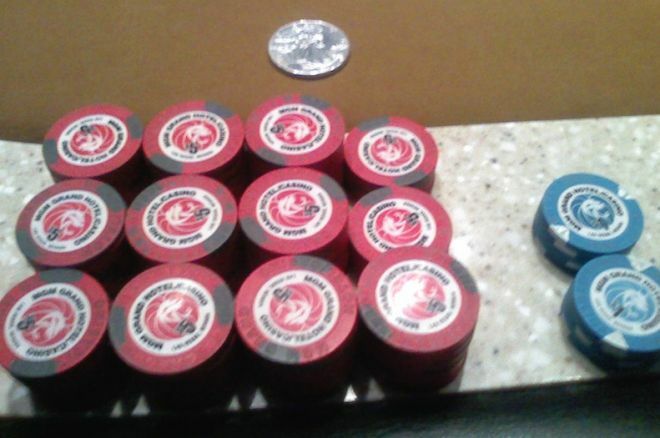 Here’s why: Poker decisions get more difficult when you have more chips in play. Suppose you have flopped a set (yay! ), but the board gets scary with possible straights and flushes (boo!). Now your opponent bets enough that you will have to risk all of your remaining chips to call. That decision is trivially easy if you have just $10 left, harder if you have $100 left, and much harder if you have $1,000 left. If you are, on average, better at making those big-money decisions correctly than your opponents are, then you’re going to be able to make a lot more money playing a big stack than a small one. If, however, your opponents have the edge in those difficult decisions, a deep stack will just mean that you lose more money per hour than you would by playing short. A small buy-in generally means that most of your decisions will be made preflop and on the flop. You will have few or no bet-sizing decisions later in the hand, because either all of your chips will already be in, or the amount you have left relative to the size of the pot will reduce your decisions to binary ones: all-in or fold. Those are obviously easier choices than when you have a deep stack and a full range of bet-sizing options available. One final option worth considering is a sort of hybrid strategy in which you start with the minimum buy-in to test the waters, though keep open the possibility of buying in for more afterwards. Figure out whether this table is fishy or sharky, tight or loose, profitable or likely to devour your money. If things look good, add on as much as you can to take full advantage of a favorable situation. Otherwise, move to another table, another game, another casino — or just wait for another day.